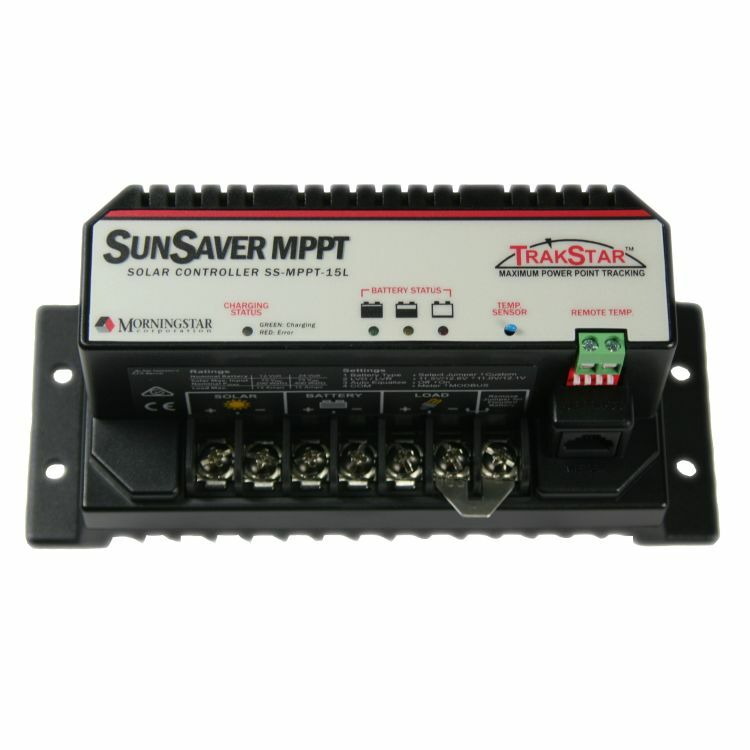 Morningstar’s SunSaver SS-MPPT-15L MPPT solar controller with TrakStar Technology™ is an advanced maximum power point tracking (MPPT) battery charger for off-grid solar / photovoltaic (PV) systems. The controller features a smart tracking algorithm that maximizes the energy harvest from the PV and also provides load control to prevent over discharge of the battery. Another benefit of TrakStar MPPT technology is the ability to charge 12 or 24 Volt batteries with solar arrays of higher nominal voltages. A 12V battery bank can be charged with a 12 V, 24 V, or 36 V nominal off-grid solar array. Certain grid-tie solar modules may also be used as long as the solar array open circuit Voltage (Voc) rating will not exceed the SS-MPPT 60V maximum input Voltage rating at worstcase (coldest) module temperature. Higher solar input voltage results in lower solar input current for a given input power. High voltage solar input strings allow for smaller gauge solar wiring. 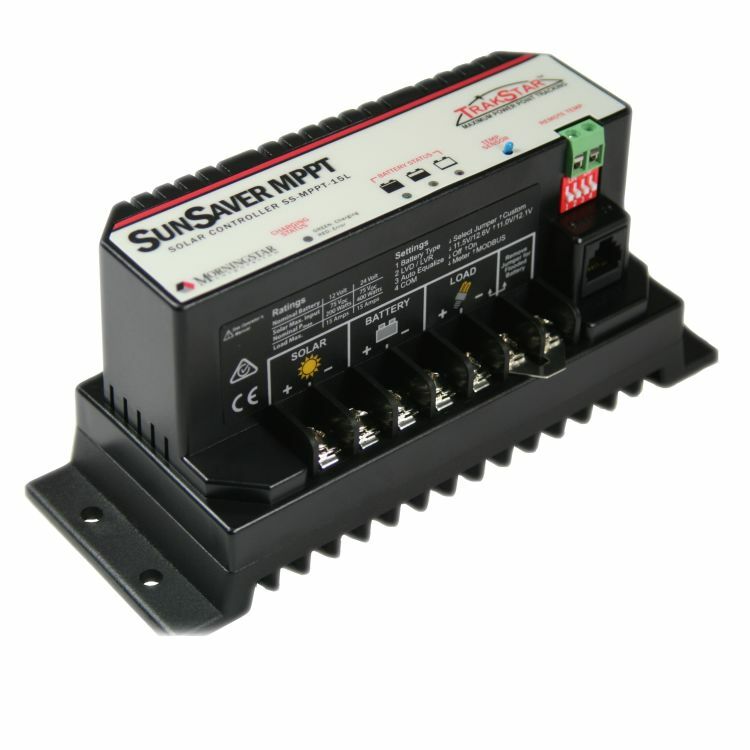 This is especially helpful for systems with long wiring runs between the solar array and the SS-MPPT. The SunSaver MPPT is well suited for both professional and consumer PV applications including automatic lighting control (lighting controls requires accesories sold seperatly). Its charging process has been optimized for long battery life and improved system performance. This product is epoxy encapsulated for environmental protection, may be adjusted by the user via four settings switches or connection to a personal computer (accesories sold seperatly for PC connection), and has an optional remote meter and battery temperature sensor sold seperatly. Maximizes Energy Harvest - TrakStar MPPT Technology features: Peak efficiency of over 97%, Almost no power losses, Recognition of multiple power peaks during shading or mixed PV arrays, Excellent performance at low solar insolation levels. Higher Voltage PV Arrays - Provides a means to use a higher voltage PV array to charge either a 12V or 24V battery. Lower System Cost - Less expensive than other MPPT controllers and is affordable in smaller PV systems up to 400Wp. Allows system costs to be reduced by down-sizing the PV array, using on-grid or thin film modules and decreasing cable sizes. Load Control - Automatically disconnects loads when the battery has been discharged to a low state of charge. Personal Computer Connectivity (The Following PC Accessories Sold Separately) - NEW USB MeterBus Adapter for laptop compatibility. PC MeterBus Adapter for RS-232. Fully adjustable user selection via on-board preset switches or customized with PC connection. Advanced automatic custom programmable lighting control with a PC connection. Extensive controller and system data is provided by the status LED’s and optional meter. Monitoring is also available with a personal computer. 30 days of internal data logging of key PV system operating parameters. Smaller Size - Mechanical dimensions are less than other MPPT controllers, making it easier to install in equipment enclosures. Highly Reliable Efficient electronics, a conservative thermal design and tropicalization result in high reliability and long life. Extensive Electronic Protections - Fully protected against most system errors and faults. Traditional controllers connect the solar module directly to the battery when recharging. This requires that the solar module operate in a voltage range that is below the module’s Vmp (Voltage at Maximum Power). In a 12 V system, the battery voltage may range from 10 - 15 Vdc but the module’s Vmp is typically around 17 V. Because traditional controllers do no operate at the Vmp of the solar array, energy is wasted that could otherwise be used to charge the battery and power system loads. The greater the difference between battery voltage and the Vmp of the module, the more energy is wasted. TrakStar MPPT technology will always operate at the Vmp resulting in less wasted energy compared to traditional controllers. Do you own the SS-MPPT-15L? Please, tell us what you think about it. It helps us provide you with better products. Please note that it may take up to 72 hours for your review to appear.